This page has a few of my favorite autostereograms and includes an explanation of how they work. I actually spent at least four years trying to see them, but only succeeded after I read an article explaining how they work. (It was published in the October 1994 issue of Computer, membership magazine of the IEEE Computer Society.) Still took me 30 minutes or so after reading the article. There's a separate page for some of the larger autosteograms. Can you see how many mushrooms are in this picture? Autostereograms work by a pretty simple mathematical trick. The basic idea is to find or create 'matches' between background points and points on the three dimensional object. Not just any matching point, but points that match in the plane of the paper. The following diagram should help make clear what is going on here. 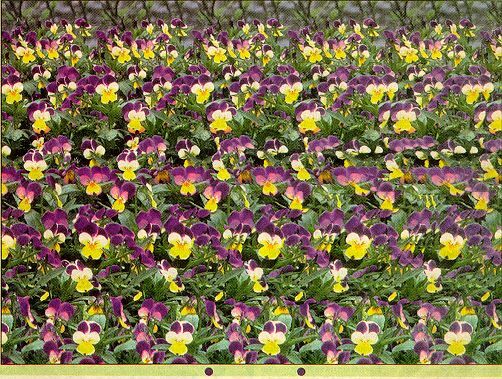 Someone is looking at the autostereogram, and you are looking down from above. The point on the object and the point on the background are both red, and there are four lines involved, one from each eyeball to each point. But at the plane of the paper (or computer screen, in this case) there are ONLY three red points. With a computer program, we can find or calculate all the points where this relationship holds, and the result is that at the plane of the paper, we can arrange the points as though there was really a 3D image behind the paper. The trick of viewing these pictures relates to separating focus from convergence. The points you are viewing are really on the paper or the screen, and both eyes need to focus on those points. But the image will have a distance that is farther away, which means that the convergence of your eyes needs to be different from the focusing distance. I try to imagine that the paper is just a kind of window or mirror, and I'm looking through it. With paper, it helps to do it in bright light, because then you have more depth of focus. It's actually easier with the computer screen to imagine it as transparent. Besides the cup and saucer, what else is in this picture? Perhaps the most amazing aspect of this is that such images have never existed in the course of human evolution--they could only be created after computer graphics got to a pretty high level of development. And yet the human visual system is powerful enough to deal with such unprecedented stimuli, and extract the meaning hidden within. Amazing.